"Make it Manzanar" is a series of posters (24" x 36") presented at my MFA (Master of Fine Arts) Advancement Show (10/09/16) at California State University, Long Beach. 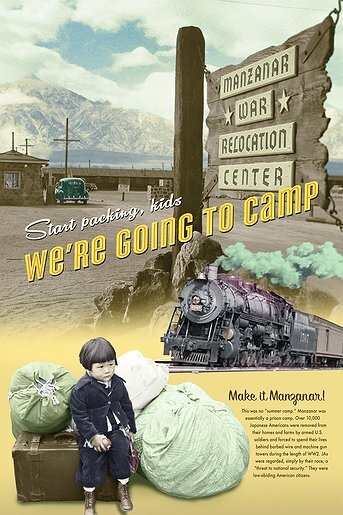 The poster campaign employs a travel or vacation theme from the period (1940s) as a means to sardonically illustrate the "joys" of camp life at Manzanar. The reality (when read in the body copy) was quite the opposite. During the the War, the U.S. Government (WRA, or War Relocation Authority) actually tried to portray camp life as idyllic. Famous photographers like Ansel Adams, Dorothea Lange, and Russell Lee were employed by the WRA to portray and promote "normal" life and conditions in Manzanar. The propaganda was that Japaneese American internment was necessary for their protection. Life was wonderful, ingoring the fact that condtions were most often dusty, hot or freezing cold. Barbed wire surrounded the camp and armed sentries had their rifles pointed inward. JAs were prisoners. Jailed without due process. A failure of our Constitution. Could such a thing happen again? Racial profiling and mistrust of foreigners? It's possible. When asked during the Republican primaries about JA inernment camps, candidate Donald Trump fully supported the idea of relocating and imprisoning Japanese Americans...if he were President at that time. In his mind, and others, war trumps (pardon the pun) Constitutional Law. The images are from the National Archives, and combines the works of Russell Lee, Ansel Adams and Dorothea Lange. Design and copy are copyright © David Toyoshma, 2016. All rights reserved. No rerprinting or republishing without written consent. For details or a better look at the copy, please contact author (David Toyoshim). toyoshimad — Last modified Oct 28 2018 10:54 a.m.